Europe’s consumer appliance giant Technicolor SA-owned Thomson TV has dedicated the new financial year to content-based marketing initiatives with an aim to reach the target audience. The brand that marked its re-entry into the Indian market last April has from the very beginning nailed its communication and marketing with the ‘Make in India’ initiative. All Thomson TV units were manufactured in their Jammu, Himachal Pradesh and Uttar Pradesh’s manufacturing set-ups. Now, to add a more local touch to their marketing initiatives Thomson TV is looking at strategic tie-ups with content providers. “Content is now being made especially for Smart TV with the use of technology and special effects that can only be enjoyed on TV and not on mobile phones or laptops. We plan to tap that section of the clientele, which watches such content on Smart TV. We have dedicated the year to content and will use it to reach our target audience,” said Avneet Singh Marwah, CEO SPPL, Exclusive Brand Licensee of THOMSON in India. Earlier this year, the brand also entered into an exclusive partnership with OTT platform ZEE5. Under the partnership, the TV brand offered a 1-year complimentary ZEE5 subscription to its first 1,000 customers on Thomson TV Day Sale on Flipkart. The brand will soon announce more tie-ups with OTT platforms this fiscal, Marwah said. Most of the sales of Thomson TV in Tier II and III cities happens online as the locals do not have access to quality products otherwise, he said. Hence the brand’s target would be to go regional in terms of tie-ups with content providers, Marwah added. In the one year of its presence in the Indian market, Thomson has found a head start to capture the market with its 43 UHD 4K, 40 Smart and 32 units. In less than 45 days of its India operations, the exclusive brand licensee (Super Plantronics Private Limited) recorded a sale of 30,000 Thomson TV units through its exclusive online partner Flipkart. 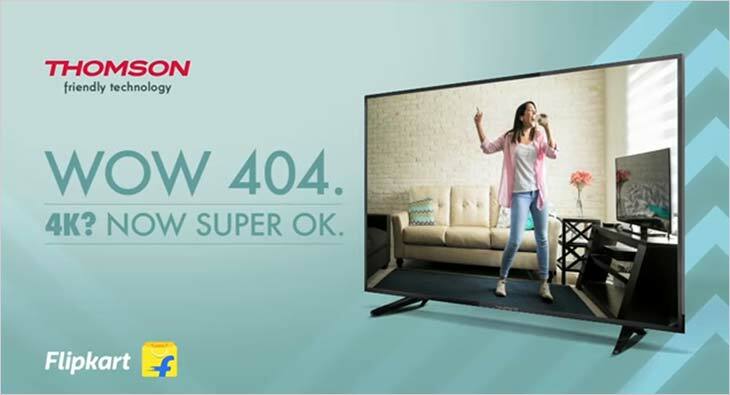 The brand recently launched their new campaign '#WOW404' which was specially designed to promote the latest edition of THOMSON SKU’s - the 40 inch 4K TV. Last December, Thomson TV announced an investment to the tune of Rs 150 crore in new manufacturing units in India. In 2019-2020, it has set itself a target of manufacturing half a million units. Growing at an average of 35 per cent quarter-on-quarter, the brand is bullish about India and is eyeing revenues of about Rs 500 crore in the next 2 to 3 years.